The targeting vector has been generated using C57BL/6J DNA and transfected into Taconic’s C57BL/6N Tac ES cell line. Lair1 exon 1 contains the translation initiation codon. 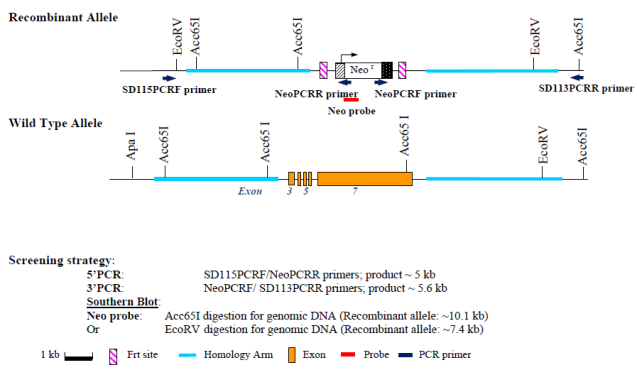 Exons 3 to 7 have been replaced by the FRT site flanked neomycin resistance gene cassette. Deletion of exons 3 to 7 should result in loss of function of the Lair1 gene by removing most of the coding sequence. Datamining and Design performed in 2005.